The stitches used in stumpwork range from simple line stitches to more complex filling stitches and lace stitches. Practically any ground fabric is suitable for stumpwork. Threads commonly used include wool, cotton, and silk. 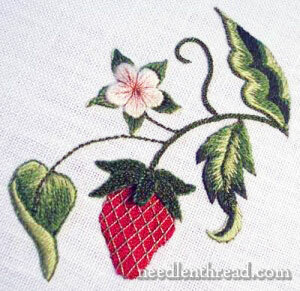 This style of embroidery is enjoying a great resurgence of popularity these days. There are several masters of the art out there, but perhaps the most prolific when it comes to writing instructional books is Jane Nicholas. Her books are a delight to the eye and are excellent for instruction and inspiration.